Pontian member of parliament Ahmad Maslan (left) says Education Minister Dr Maszlee Malik should know that "each word that comes out of his mouth, especially in Dewan Rakyat, could be turned into policies". - NSTP. 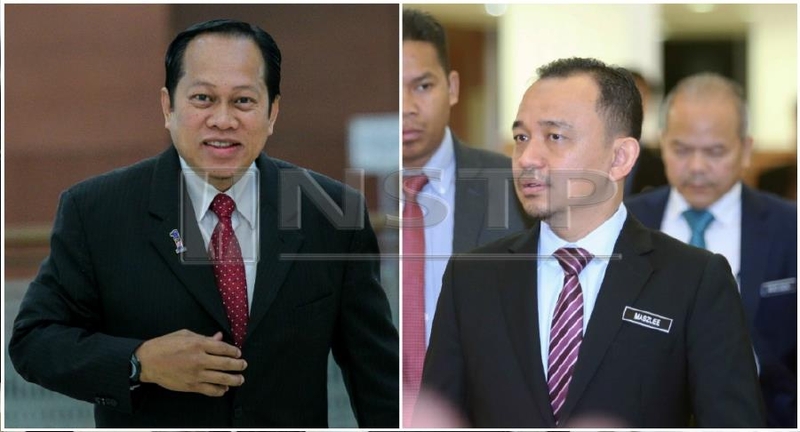 KUALA LUMPUR: Pontian member of parliament Ahmad Maslan has one advice for Education Minister Dr Maszlee Malik – Keep your cool and understand your duty as a minister. Ahmad who was formerly Deputy Minister of International Trade and Industry said Maszlee should know that "each word that comes out of his mouth, especially in Dewan Rakyat, could be turned into policies". Sharing with the New Straits Times on their encounter in Parliament on Monday, Ahmad said those outside the Dewan did not know that former Prime Minister Datuk Seri Najib Razak had just walked in when he finished asking a question to Maszlee. “I was asking my question nicely and calmly and the minister suddenly responded by blabbering about 1Malaysia Development Berhad (1MDB) the moment Pekan MP entered the hall. “He responded to my question, agreeing that if we do not know our history, we are bound to repeat its mistakes. He used 1MDB as an example and immediately made the decision that it be part of the history subject. “If Najib had not been in the Dewan, I am confident that he would have focused on answering my question,” Ahmad said. Maszlee’s press secretary Shahrul Aman Mohd Saari has since clarified that the minister said the 1MDB scandal would be part of Malaysian history and not History textbooks when responding to Ahmad’s question. The aide said whether or not 1MDB would be part of the history syllabus was up to the curriculum research committee within the Education Ministry, adding that they had no qualms about 1MDB being discussed at the tertiary education level. Ahmad said as a minister, Maszlee who is also Simpang Renggam MP, cannot make such remarks in haste as it could be taken seriously by many stakeholders and cause a ripple effect. The Umno Supreme Council member said he was giving Maszlee a sincere "neighbourly" advice, referring to their constituencies which are geographically situated next to each other. Ahmad said he also raised two other issues - that history subject be taught in private schools including the 60 independent Chinese schools and what constitutes for an event to be included in the history syllabus. Both, he said, went unanswered.